(Nanowerk News) IK4-Tekniker is taking part, together with companies such as Acciona or Rolls-Royce in the MiRoR European project, conceived in order to create a miniaturised robot capable of carrying out repair and maintenance tasks in an autonomous manner and in inaccessible environments. Certain industrial complexes, such as energy installations, with restricted or dangerous environments, nuclear power plants or petroleum platforms, require repair and maintenance that pose potential danger to workers. Others, due to the complexity of their design, require maintenance in inaccessible places that cannot be undertaken by persons. This means a greater difficulty of access and new requirements when carrying out repairs or simply when undertaking routine maintenance tasks. 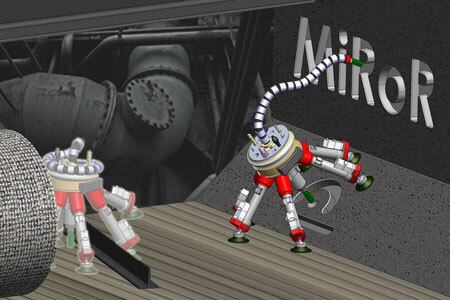 To this end, a consortium has launched the MiRoR project, in which IK4-Tekniker is participating, together with seven other bodies - universities, companies and technological centres -, within the VII Framework Programme of the European Union, in order to design a miniaturised robot capable of carrying out repair and maintenance tasks with a high degree of precision and flexibility. Given its characteristics, the MiRoR project is designed for application in sectors that require large investment. On the one hand, for industrial sectors related to energy, such as nuclear power plants or plants for the extraction of gas and petroleum. On the other, it is aimed at large civil engineering works. Moreover, the robot also has applications in sectors such as the production of large reactor engines for the air industry. To this end, the project has the participation of large companies such as Areva, Acciona, Petrom and Rolls Royce. The project, initiated this year, is expected to culminate with the development of the robot in 2015. The robot is made up of two complementary robotic systems that provide it with a great level of flexibility. The first is a base with six legs and the twin capacity of being able to move autonomously and to carry out precision machining processes by means of kinematics. The second system consists of a semi-rigid robot arm that enables gaining access to very narrow spaces. Thanks to a patented system for conferring rigidity to the arm segments, the robotic arm is able to carry out inspection and machining tasks in inaccessible places. The combination of the two systems is controlled by a three-level system: a low-level control for machining processes, an intermediate level for the robot movements in the work environment and a high-level control that provides intelligence to the system. Intelligent control enables the robot a wide range of navigation functions, such as local and global location and planning of itineraries, as well as the calibration of machining and obtaining optimum positioning of the robot’s legs. The robot is also fitted with systems enabling it to take decisions about the best way to access a work zone, as well as to adapt to any knowledge it has acquired previously as it works. It is also equipped with an auto-protection system for situations involving dangerous conditions in which it finds itself. For the optimum performance of the robot, the system includes a virtual test bank that enables identifying the best configuration of the device for each work environment as well as simulating and predicting the behaviour of the robot facing obstacles and unforeseen circumstances.